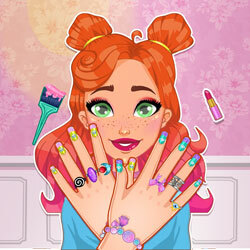 Description: Jessie came to your beauty salon for a total makeover, hair, make up, nails, the works! You'll have to choose her eyelashes, the perfect make up and add some lipstick and blush. Pick the best hair color for her look, and then add color to her nails and some accessories that fit with the whole look.